We present you a culinary hit straight from the land of Toussaint! Thanks to courtesy of CD Projekt RED we were able to make this dish with the original Butcher of Blaviken wine. The label says that it’s the wine embodiment of Geralt of Rivia. 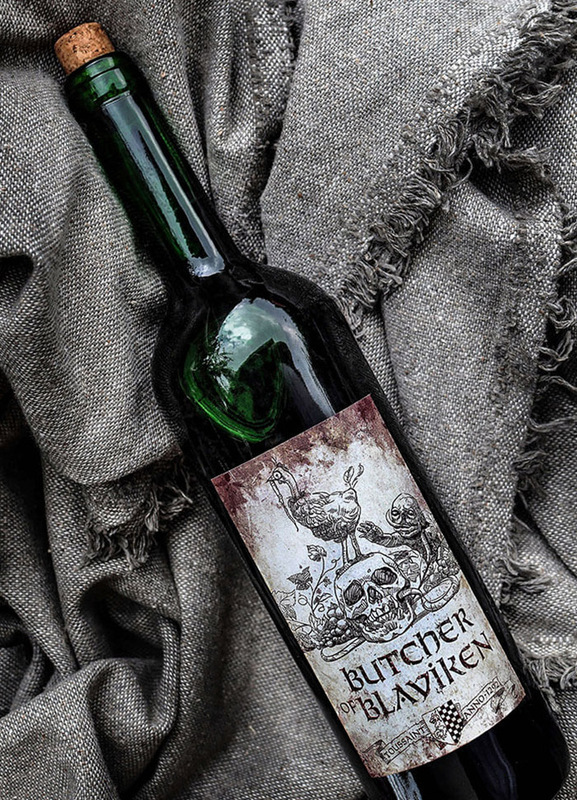 Made of Vermentino grapes (dark variety), crushed with silver swords, spiced up with sweat and fermented in saddlebags, the Butcher of Blaviken wine leaves a rough feeling on the lips and a tangy taste of blood and skin, and bites like no other on the next morning. It calms the nerves after the fight with botchling, and also can lull to sleep despite zeugl's foul odor on the clothes. Apparently it tastes great with a chicken sandwiches. Such unusual and rare liquor deserves a decent dish-pairing, so we chose one of the most exquisite food appearing during the adventure in Toussaint. Burgundy Beef, or "boeuf bourguignon" - is clearly inspired by French cuisine and can be purchased from local innkeepers throughout Toussaint. Preparation in Burgundy style means the use of characteristic ingredients: wine, pearl onions, mushrooms, and often also bacon and bouquet garni (bouquet of spices - mainly with parsley, bay leaf, thyme and other herbs). Many recipes for this beef focus on the roast version, but due to the rather difficult availability of the appropriate oven on the trail we decided to stew it in a pot. We also omit the marinating stage to slightly reduce the total preparation time.The proposed recipe is based on a traditional recipe, but slightly simplifies the preparation, so that each traveler can enjoy the exquisite taste of this unique dish. 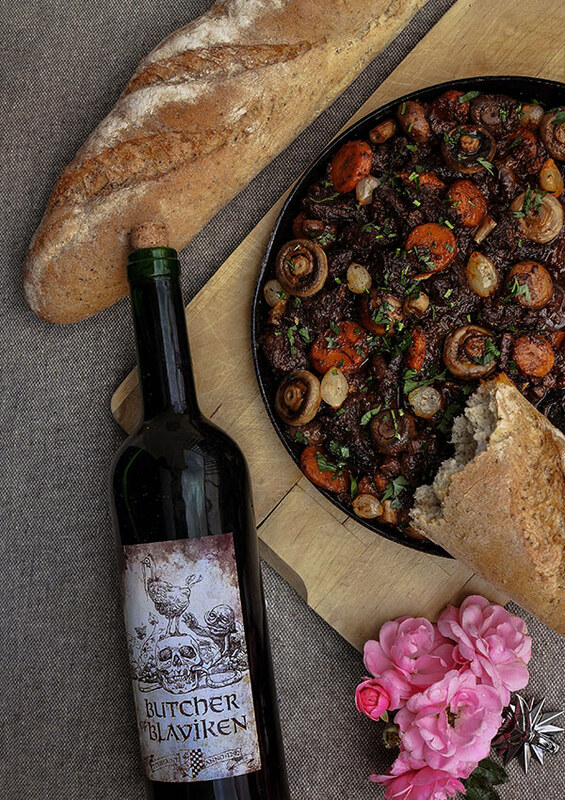 Run for a bottle of wine and cook one of the most delicious dishes of the Witcher Kitchen! 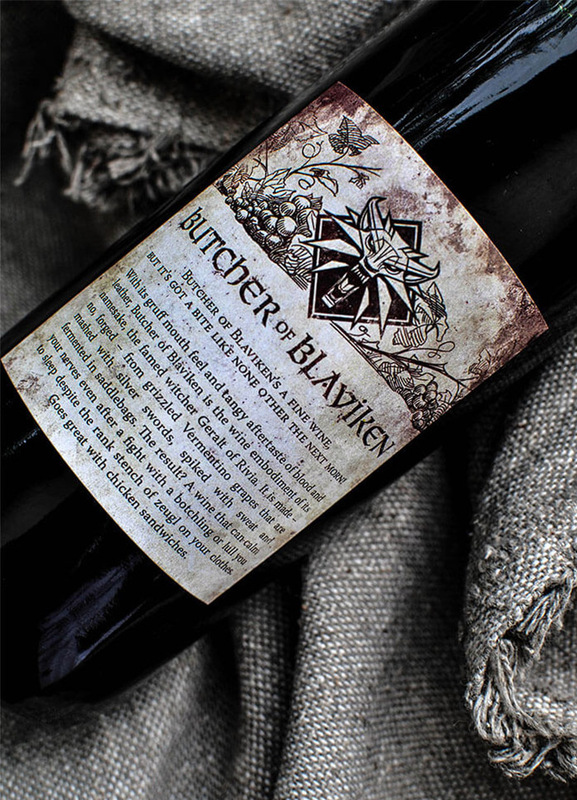 Butcher of Blaviken unfortunately can not be bought in stores, but it can be successfully replaced with regular red dry wine. It is important that you buy the liquor you like, so try it before cooking. Let Melitele protect you against adding wine you do not really savour - after cooking it will not be any better! When it comes to meat, a brisket will be great for the dish. It is a relatively cheap piece of beef, you can stew it for a long time, and it also contains bones that will be useful for making a broth. You can also buy a shin or bladel. It is also worth asking a good local butcher for a piece of meat dedicated for long cooking. Remove the skin from the bacon and cut the fat into thin slices - about 1cmx4cm. If it's smoked, you can cook it for a few minutes in boiling water and drain off (that the taste of the smoked meat should not be too intense to other ingredients). Heat up the oil in a frying pan, put the pieces of bacon and fry, stirring occasionally, until you get a brown crust. The fat should mostly melt. Put the scratchings into a pot in which we will cook the stew. Leave the melted fat in the pan for a further use. Remove the larger pieces of fat from the meat (leave the smaller ones - it will enrich the taste and consistency of the stew) and separate the meat from the bones. Then put the bones in a saucepan, add thyme, some salt and pour 1.5 glasses of water. Cook under lid, simmer for about 1 hour. After this time, discard the bones, strain the stock and set it aside. Cut the separated meat into bigger pieces, more or less 10x5cm - often the recipes recommend to cut the meat into a finer cube, but this causes the juices to run away from it, so it is better to fry the larger pieces and then cut them into smaller ones. Use the pan with the remaining fat from bacon, warm it up and put pieces of beef - they can not touch each other and should have some space. The point is that they will fry, not stew. Fry the pieces for about 2-3 minutes on each side for strong browning. They will be still raw in the inside, but this is how it should be. Then put the pieces of meat on the plate to cool down. When they are cold, cut them into smaller particles, for example thick stripes. Then transfer them into a pot with pork scratchings. Chop the onion and fry on the same pan for about 3 minutes until brown, stirring (if necessary, add some oil). Add the crushed garlic and fry for half a minute. Transfer everything into a pot with bacon scratchings and beef. On the same pan, fry thick slices of peeled carrots until golden brown, on both sides, add some oil if necessary. After frying, put aside in a separate bowl, because carrots will be added at the end of stewing process. Wash the mushrooms under running water and cut off the stems. If they are large, cut them in half. Melt the butter in the pan, add the mushrooms and fry until golden brown for about 3-4 minutes. At the end, add some salt and pepper, mix. Transfer to a bowl with carrots for a further use. Pearl onions rarely appear in the innkeepers storage (marinated in vinegar from the jar are not suitable), but you can replace them with half cut shallots. Place onions in a frying pan with 1 tablespoon of butter and fry for few minutes until golden. Put in a bowl with carrots and mushrooms. Put the wine on a hot pan, on which we fried everything, and cook for a while. In this way, we remove from the pan the remains of the "taste" from frying. Then we pour warm wine into a pot of meat. Add a beef broth to the pot with bacon, meat, onions, garlic and wine. Add half of the parsley and 1 bay leaf. Stir, cover and simmer for about 2-3h until the meat is soft, stirring occasionally and pouring wine if too much liquid boils out. After 30 minutes, remove the parsley, and after 1.5 hours, add salt and a little tomato paste for taste and a better color. 20 minutes before the end of simmering, pull the bay leaf and add fried mushrooms, onions and carrots. Put the ready goulash out of the fire and season it if necessary. 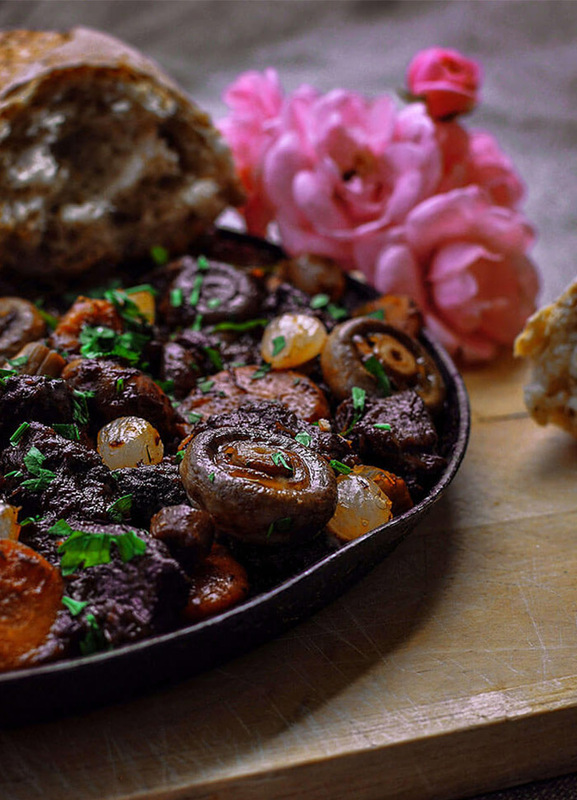 The boeuf bourguignon should be left in the fridge for the whole night - then it will taste even better. We serve the dish with chopped parsley and eat in the company of a large piece of fresh baguette. This site represents a content made by fans and stands as a non-profit project. The Witcher universe is created by Andrzej Sapkowski - the author of The Witcher book series. The Witcher®, GWENT® are registered trademarks of CD PROJEKT Capital Group.